Store & setup staging, chairs and tables! Granite Industries is excited for another year at the MATRA Show! Setup generally is not viewed as the most exciting activity on the planet, however, it is required by most businesses in the tent industry. 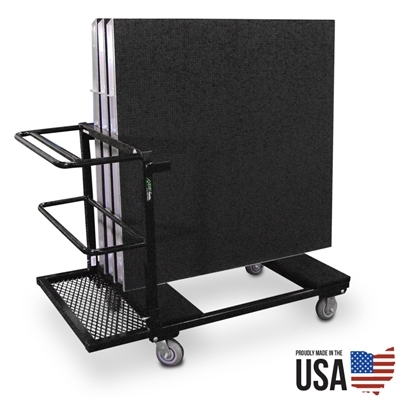 Granite has developed a wide variety of steel hand carts to help speed up the setup process. These hand carts are branded under the American Cart & Equipment name. American Cart & Equipment has been a cornerstone of the Granite family since 2003. All carts are designed, manufactured, and assembled in the Ohio Plant by local workers. One of the biggest hassles and frustrations with staging is storing and transporting the stage decks. American Cart worked to develop a solution to this with the creation of the stage deck storage cart. This cart is built from US steel, welded by hand and then powder-coated to ensure proper protection. There are two models available, the 67195 for 4′ decks and the 67194 for 8′ decks. Each model holds up to ten decks and is narrow enough to pass through a standard doorway. The planks are carpeted for stage deck protection. Banquet tables are heavy and awkward to transport. Storing them can be even more of a challenge, as loading and unloading them gets tiring quickly. This cart addresses those issues. With a capacity weight of 1,500 lbs, it is near impossible to overload these carts. The average 8′ banquet table weighs about 70 lbs, which means it would take over 20 stacked tables to get close to the weight limit. The carts can be stacked on top of each other to minimize the overall footprint. Removable legs allow for easy loading and unloading. Available with 33″ legs or 66″ legs. Banquet chairs that do not fold present a wide variety of issues. They can be difficult to pick up and carry, especially long distances. 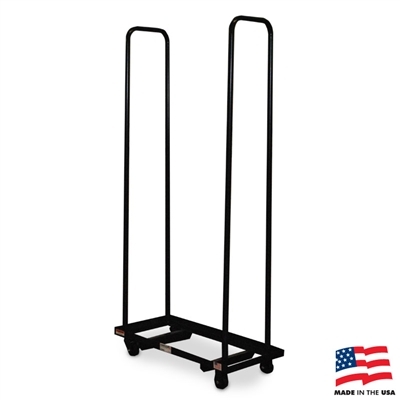 The Chiavari Cart from American Cart presents a value minded solution to this problem. Specifically designed to handle chiavari chairs and similar style chairs, this cart speeds up setup and tear down. The gray attachment can be American Cart Chiavari Chair Cart with chairs loadedfolded down and allows the cart to operate like a standard hand truck. Features no flat tires. 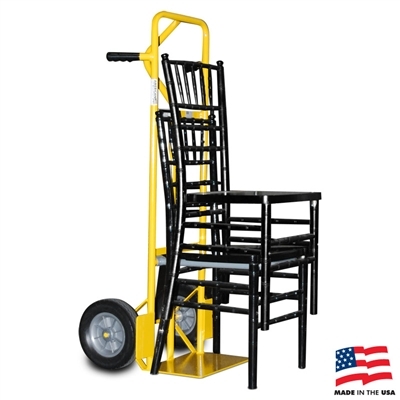 When simplicity is the top priority, the chair pallet from American Cart shines. Designed to minimize floor space footprint and maximize storage space, the 70″ height allows for plenty of stacking space. Built from steel and powder coated, this cart is built to last.